For many years, people have erected skyscrapers of concrete, glass and metal. Now it is time to breathe life into them and provide home comfort. Aquamarine multifunctional residential estate is the first skyscraper in Siberia and the Far East created as a perfect living space. Synergy of the unique design, high-tech solutions and high-minded esthetics. Height of 155,5 meters and location upon the shore of Amur bay makes Aquamarine unique in its own way and enable to materialize a combination of coziness of countryside living and benefits of town residence. The skyscraper upon the shore of Amur bay where the sound of breaking waves gives unimaginable freedom of life while filling the air with sea notes. It is in the very heart of the city - a few minutes, and a civilization stream is around you. Stay indoors, enjoy the moment when you are surrounded by the silence, coziness, fresh air, away from motor roads, power supply lines and railways. Reliability, quality and innovative technologies - all these determine architectural solutions of Aquamarine residential estate. The design for the skyscraper has been developed by highly qualified specialists from Hong Kong considering its special location, landscape-unique height of the building, as well as requirements to elite class dwelling. The best engineering solutions are used at every stage of construction. The building architecture is represented in simple and elegant style using environmentally safe materials. When there are no barriers the world offers opportunities. Step forward, look around – a blank canvas. Here, you can turn any challenging idea into reality, and the main thing, to be there where everything is as it must be. To combine rooms, apartments and floors, everything to make a home of your dream. An then, you can enjoy not only the interior but the exterior views through floor-to-ceiling windows up to 3.60 meters high opening the beauty of landscapes of Amur Bay and Golden Horn Bay. We have additionally prepared 3 planning solutions so that you can easily imagine your future residential place. The safety of residents is the most important priority for the Aquamarine Residential Estate. Here you can be sure that the protection systems work perfectly. A five-step access control system will prevent penetration into the territory of the complex and, particularly, into the dwelling areas. A modern fire protection system will preclude the occurrence of fire. Round-the-clock video surveillance in all common areas will allow you to enjoy comfort, leaving all safety concerns to us. The aesthetics of modern architecture comes across here with the endless expanses of the sea surface and is embodied in the perfect space for life. Aquamarine is not just the comfort of luxury real estate. This is a place where beauty and convenience, innovation and comfort, security and tranquility will never be in conflict with one another. Life in the city center can be free from noise and polluted air - innovative construction technologies and location solve these problems. The infrastructure can be comfortable and safe for both adults and children, thanks to the concept of “The yard without cars”, large playgrounds and a separate parking lot. All this becomes a reality in the Aquamarine residential estate. For future residents, Aquamarine is creating a comprehensive infrastructure, its own comfortable and secure elite neighborhood with everything that a modern city dweller with high demands might need. 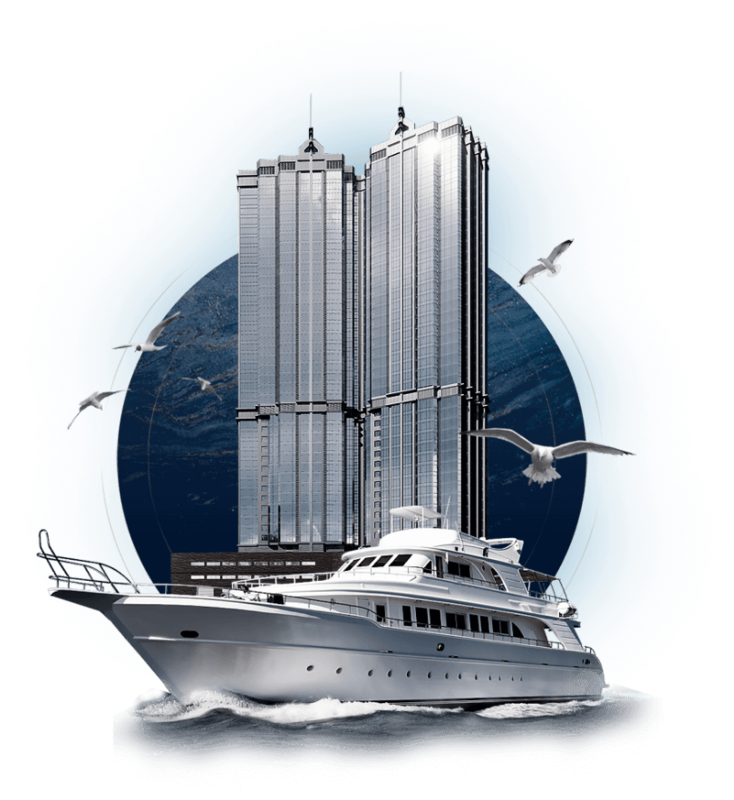 Shopping and entertainment center, children's and sports grounds, a promenade, convenient parking and even a private largest in Russia yacht club will be readily available to everyone who chooses Aquamarine as their new home. Living in Aquamarine, you can go on a boat trips literally from your own courtyard: on the waterfront near the residential estate there will be a yacht club with 400 boat slips - more than anywhere else in Russia. Possessing watercraft will become easier than ever before, whether it is a boat, jetski, sailboat or yacht. In the up-to-date service center you can get all the necessary maintenance, repairs and refueling. The size and service of the yacht club are not its only plus points - convenient access roads and additional parking are also among them. We are building a house in which kids will be eager to spend their childhood. Specially for all the young residents of Aquamarine, there will be access to developmental activities and exciting games under the supervision of highly qualified professionals. High-class preschool institution with an extended day program will be located directly in the building of the complex. Strive for a healthy lifestyle and accustomed to keep yourself in shape? In the Aquamarine Residential Estate you can do that with ease and comfort. A modern fitness center with experienced instructors and the best training equipment at any time will be within easy reach - you need only to leave the apartment. Cardio, strength exercises, yoga - in the spacious bright fitness center of Aquamarine your favorite activities will bring you even more pleasure. Moreover, only residents of the complex will have access to the fitness center. The views that open from the roof of Aquamarine Residential Estate will take your breath away. 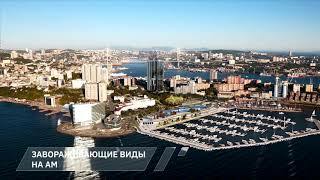 From a bird's-eye view, you can be inspired by the best views of the city, the Golden Bridge, Fyodorova Bay, Russkiy Island and the Amur Bay every day, watch sunsets and sunrises over the sea from a safe, modern observation deck with landscaped recreation areas. Also, two helicopter pads will be located on the trafficable roof of the building. Modern shopping and entertainment mall will be built near the house with observation sites, restaurants, cinema, children’s entertainment center, SPA salons, dentistry, trading facilities, offices, and parking area for 1,000 car spaces. Three-level indoor heated parking for 250 cars directly within the walls of the skyscraper: you can come back home and leave your car under reliable protection 24/7. Here you will also find a detailing center for polishing and cleaning your car effortlessly, both inside and outside. Access to the parking - directly from the building via the elevator to a warm and comfortable space, equipped with charging stations for electric vehicles. Near the complex, not far from the sea will be another heated indoor parking for 600 cars. Architecture of the complex allows joining several apartments and floors easily. Absence of columns in the building makes it possible to implement any design project. The building construction assumes free layout of each apartment, and you will be able to create the interior of your dream without any barriers. HAPPY WOMEN’S DAY MARCH 8! CONGRATULATIONS ON THE DEFENDER OF THE FATHERLAND DAY!